How to make a Christmas wreath you can eat. Some vanilla essence and green food colouring. Method : Put the butter in the microwave for one minute on LOW. add the marshmallows, stir. Put in for one minute again on LOW. Stir. Put in microwave for one minute on LOW and stir again. ...Stir until it all comes creamy... (the marshmallows have melted and mixed with the margarine). Add a few drops of food colouring and vanilla essence. Add the cornflakes, stir gently, until all cornflakes are covered in green goo. Now shape portions of cornflakes into circles. Dil-ġimgħa fil-klassi mimlija attivita'. Tistennewx li ser ikollhom ħafna homework. Illum lestejna kartolina sabiħa. Min minnkom ma bagħatx 'glitter glue', ibgħatu stoċċ għada ħalli nlestuha. Wara ser insajru. Ibagħtu fardal, maktur tar-ras jew beritta, fardal, sarvetta u pakkett wipes. U euro għax ser nixtri kollox jien. Nispera li ma nqabbdu ugigħ ta' żaqq lil ħadd. It-Tlieta PARTY. Ibgħatuhom bi flixkun x'jixorbu biss. Iktbulhom isimhom fuq il-flixkun. Today in class we started talking about the Christmas story. Soon we'll have to do writing in English and Maltese, as well as writing letters and Christmas cards. The College has organised a drawing competition for all children from years 1 to 3. Each child will draw a picture of Healthy food and another of Unhealthy food. Children have started this at school. Please finish it for homework. Thanks. ALL HOMEWORK IS FOR MONDAY. Tomorrow is half day, don't forget! In the morning children will have a P.E, Art, Music and PSD lesson...so I don't think they'll spend much time with me. That's why I gave all the homework today. Id-Dinja tiegħi. Sibu stampi tat-traffiku. Jew inkella pinġu triq, u waħħlu stampi ta' karozzi fuqha. English language : A what am I? handout. Adding using friends of 10 on Maths 2. When I was One handout on English Comprehension. 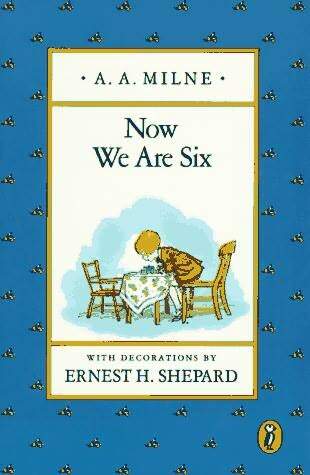 This is a poem written by A.A. Milne, as part of the book 'Now we are Six'. A.A. Milne is the famous author of the 'Winnie the Pooh' books. He was a dedicated author and father, and he wrote the stories to entertain his son, Christopher Robin. Jekk forsi kielha l-kelb, hawn hi. 3) L-indirizzi miktubin ĊARI fuq karta separata. Itfgħu kollox ġo borża tal-karti jew envelopp ikbar, agħlquh, u iktbu isem it-tifel/tifla fuq il-borża/envelopp. Ser nibgħat ukoll id-dar mudell ta’ anġlu li jrid isir nofsu d-dar u nofsu l-iskola, għax dan jieħu l-ħin. It-tfal iridu jpinġu l-biċċiet tal-anġlu, intom jekk jogħġobkom, waħħlulhom il-bicciet fuq kartonċina u qasqsulhom il-bicciet intom bil-mod, hemm xi biċċiet minnu li jistgħu jaqtgħhom huma u hemm oħrajn li tridu tagħmluhom intom. Dan imbagħad ser ngħaqqduh fil-klassi. Jekk jogħġobkom ibgħatu l-biċċiet kollha sal-ġimgħa d-dieħla ġo envelopp magħluq halli ma jitħallat xejn. Min għandu libsa ‘tal-Milied’... (anġlu, ragħaj, Madonna, eċċ) jibgħat jgħidli għax fil-Milied ser immorru quddiesa Santa Liena u ħa nagħmlu daqsxejn reċta waqt il-Vanġelju. Grazzi ħafna tas-sapport u l-ħidma tagħkom, Claudine Slater. An english exercise (simple, easy...) from the green book, page 15.